Last weekend, Thomas and I visited some of his family in Ohio. They live about 2 hours from Detroit, so we flew into that airport. By happenstance, I was watching a “Food Paradise” show on hot dogs the day before and they featured two hot dog restaurants in Detroit that are owned by the same family, are right next door to each other, and are in fierce competition. They are American Coney Island and Lafayette Coney Island. 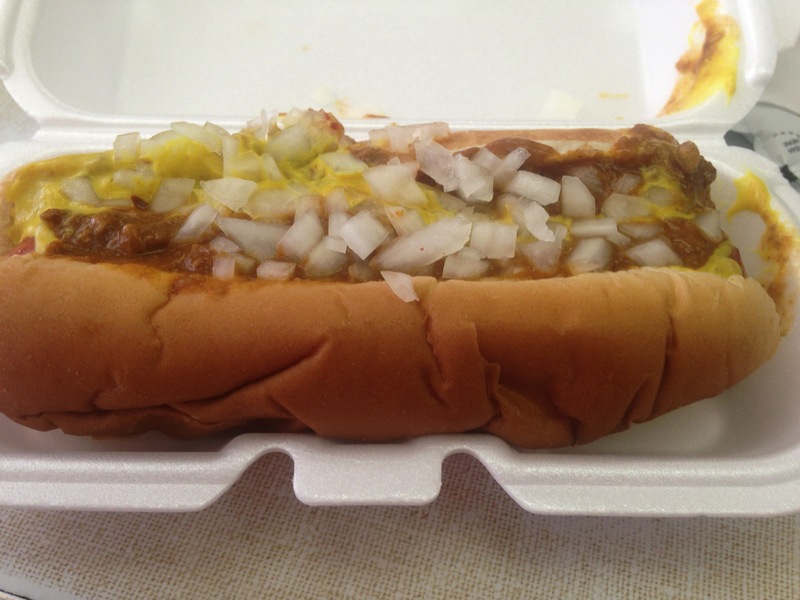 A Coney dog is essentially a chili dog consisting of a beef hot dog with natural casing, a bean-less meat chili, yellow mustard and white onion. After hearing about this and knowing that our plane landed around lunch time, I just had to drive into/ brave downtown Detroit and check this out. When it comes to food, I can be rather fearless. Here is my experience at each place and at the end, I will let you know which place I think is better–since this is a fighting issue among many Detroit natives. 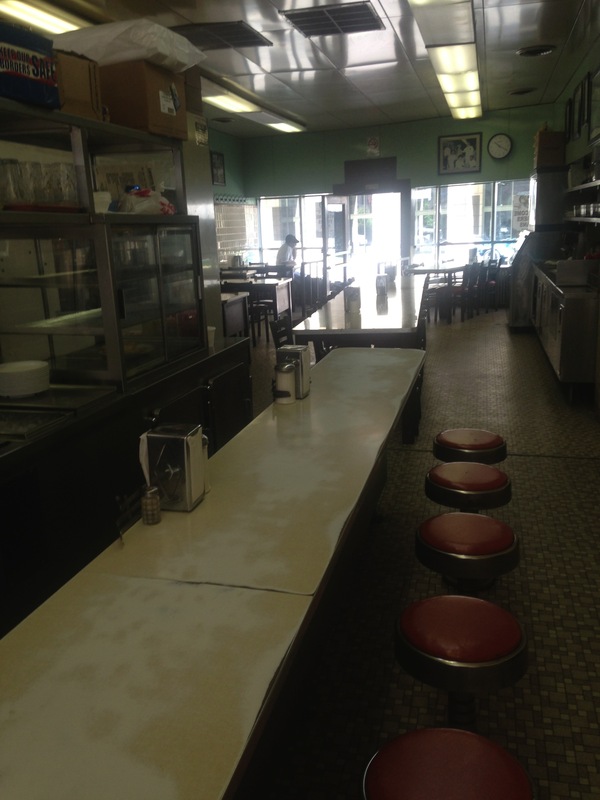 The interior, with countertops worn from many elbows leaning on them and bellying up to an authentic Coney dog. 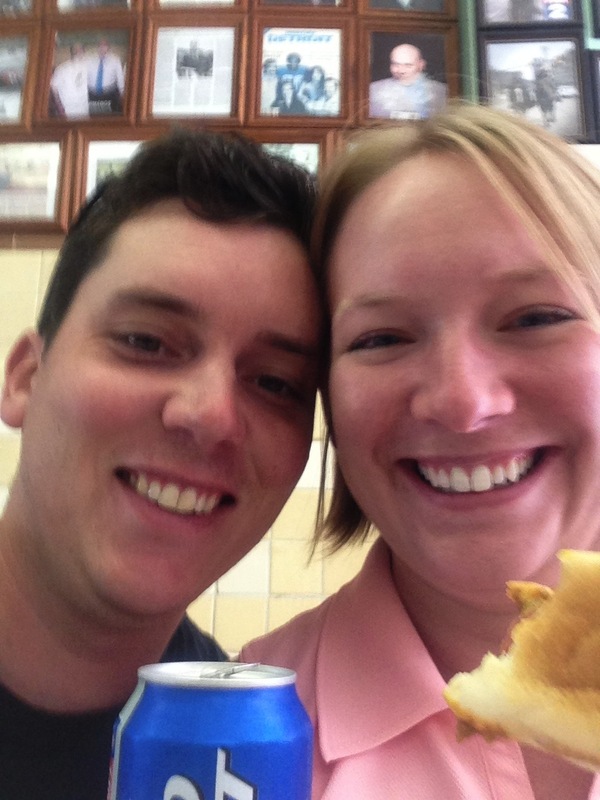 When he took a break from this, Thomas and I were able to place our order, two coney dogs, cheese fries and 2 beers. 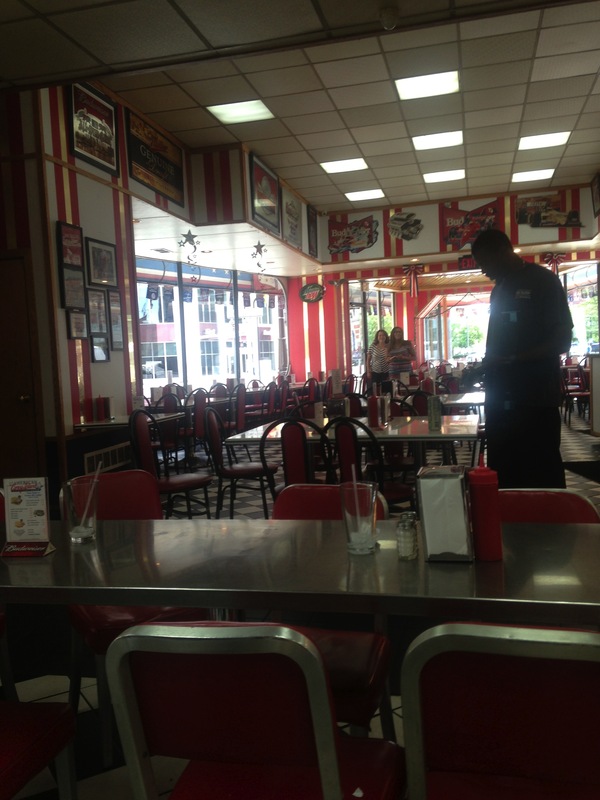 The employees here were very friendly and accommodating, with just enough of that edge you expect from a diner waiter. The menu was simple, just coney dogs and things you could make from those ingredients (a loose meat sandwich, which is just chili in a bun, and a bowl of chili were the other main options). The beer was Bud Light in a can. The fries weren’t homemade, but they were fried and seasoned perfectly with real shredded cheddar on top (no faux cheese go here). And the hot dogs were delicious, after our first bites Thomas and I looked at each other and simply said “mmmm.” The hot dog had an excellent beefy flavor and the casing gave it a light “pop” which contrasted well with the soft, meaty chili. The chili itself was very simple and the seasoning weren’t aggressive at all but there was a real depth to it that came from hours of cooking. With that, the onions and mustard both had a sharp tang. Everything melded together into one perfect bite. It was divine. 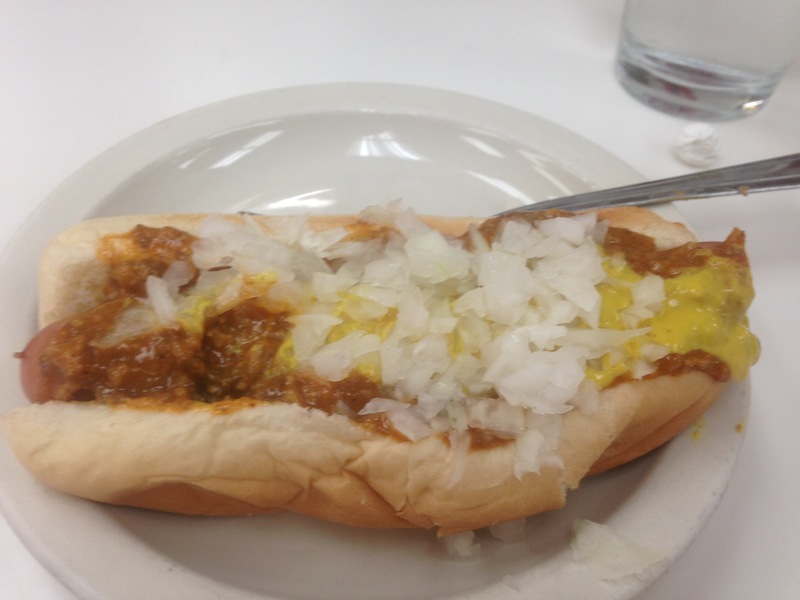 Next door is American Coney Island and you can’t miss it. There are banners, awnings, and a real bright sign. Although this place looks newer, it is actually the older of the two places. American opened first in 1917 by Gust Keros and the place became really popular so he brought his brother, Bill, over to America and trained him. They ended up not getting along so well and a few years later Bill left American and opened Lafayette in the empty building next door with a different chili and hot dog (and onions, I think). Walking into American was a little like walking into a theme park–it was bright and overly decorated. It was a lot bigger than the place next door and these employees were all young and, well, American. I didn’t see any older Greek gentlemen here to remind me who owned the place. There was a sign on one wall advertising their “Coney Kits” that they sold as fundraiser opportunities and a separate counter for ice cream. The menu was also expanded here, containing some Greek dishes like gyros and chicken Greek salads as well as wings. A visit to their website revealed that they also have a location in Las Vegas (I cannot find any website for Lafayette). Our waiter was very friendly and we ordered the same thing (minus the fries). After taking one bite the difference was immediately apparent. This hot dog was spicier and much more assertive, it was also paler in color. The casing had more of a “pop” which I felt got in the way at times. Sometimes I would bite into the dog and have to pull a little bit, leaving some casing hanging behind. While Lafayette’s chili seemed to rely on a long cooking process to impart a deep flavor, American seemed to rely more on spices like chili powder and cumin. And for some reason the onions here were milder, and I missed that sharp tang. I suspect that American uses a Spanish onion while Lafayette uses the sharper yellow onion. Overall it was a good dog, but I got tired of all the assertive spices after a few bites. In the end, Thomas and I reached the same conclusion. For it’s more authentic, laid back atmosphere and for it’s slow cooked chili that melts into the perfect bite Lafayette was the clear favorite. It may not be as shiny (or, unfortunately as successful) as American but it felt real and they’ve really worked to perfect one simple thing, which is something I have to respect. So, people of Detroit (or visitors like me), if you’ve been to these places which is your preference?